The scale of mismatch between the agency’s data and the 2014 census results is evident from the chart above. 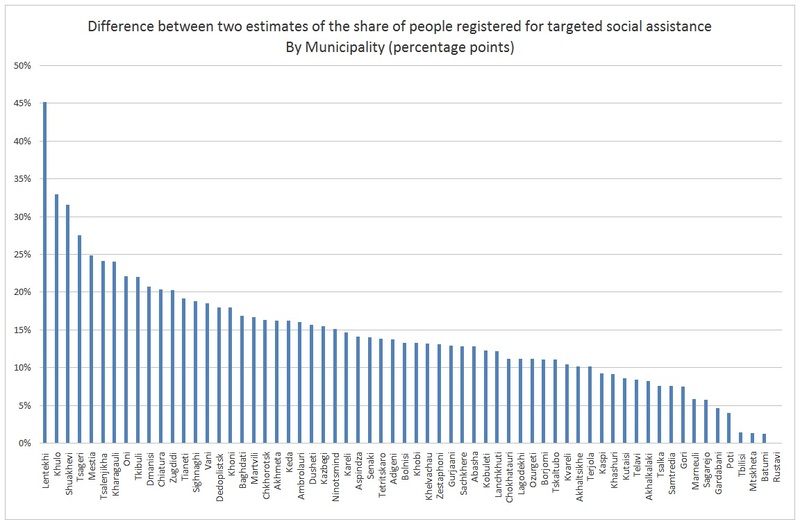 Using Geostat’s population estimates, the agency calculates the share of the population registered for targeted social assistance in each municipality. The census was conducted in November 2014, so it is possible to re-calculate the share of those registered for targeted social assistance based on the census data and compare it with the agency’s estimates. Let’s take the extreme case of Lentekhi. The agency reported that 44 percent of the population applied for targeted social assistance. When the census data is used, the finding is that 89 percent of Lentekhi residents registered for social assistance. Thus, the SSA estimate was 45 percentage points lower than the actual percentage. The chart above plots the differences between the shares of the population registered for targeted social assistance, as calculated and reported by the SSA on the one hand, and updated calculations based on the 2014 census data on the other, for each municipality in November 2014. Overall, the agency underestimated the share of applicants by 14 percentage points, on average. However, publicly available data has yet to be adjusted based on the 2014 census. Koba Turmanidze is the Director of CRRC-Georgia.